Executives from Dow Chemical are looking to the staff at SCDP for some damage control. It seems that American students have been protesting the company’s presence on college campuses after seeing the injuries and deaths the Viet Namese have suffered as a result of the use, by American forces, of Dow’s creation – napalm. Harry Crane has come up with the idea that Dow can turn the whole disaster around by having Joe Namath appear in a feel-good musical, and just to seal the deal, he also suggests that Joey Heatherton should do a little song and dance with the legendary football player. The execs seem to think that it’s a great way to go. Put Broadway Joe in a straw hat, dancing and singing with a hot blonde, and all of America will forgive and forget about children being burned alive while covered in toxic chemicals. Megan Draper is offered a larger role in her soap opera “To Have and To Hold”, but it’s going to require that she do a love scene with one of the male leads. She’s scared to death to tell Don, but decides that honesty is the best policy when it comes to her marriage and breaks the news to her husband, right after pouring him a drink and promising a dinner of coq au vin. Don takes the news just as we, and probably she, thought he would – by cutting her down. He tells her that he’ll support her career but he won’t condone the or encourage the love scene. Don has a way of looking in a mirror and never seeing his own hypocrisy. The show’s producer and his wife invite the Drapers out for dinner under the premise that they’re going to talk about Megan’s burgeoning career. What they really want is Don and Megan, as the other half of a four-way bedtime romp. Megan doesn’t quite pick up on what they’re asking for, thinking they just want to get to know them better, but Don, whose own experience is much more vast than his wife’s, catches their less than subtle advances and politely turns them down. Don’s got a lot of irons in the fire, so to speak. Sylvia Rosen meets up with him in the elevator of their apartment building and, after a hot and heavy makeout session, tells him what times she’ll be available while her husband is busy tending to his patients. Just to extra sure, she says that she’ll leave a penny under their doormat so that Don will know the coast is clear. On the business side of things, Don has also chosen to betray his longtime client, the Mr. Beans representative from Heinz, by preparing a presentation for Mr. Ketchup. So much for dancin’ with the one who brung ya. The campaign is being carried out in stealth mode with Stan working behind locked doors and tin-foil covered windows on “Project K”. The whole office is wondering what’s going on, but only Don and Stan are privy to the information, and they’re giggling up a storm while sharing a joint in the secret room. Peggy, acting on the suggestion by Teddy, is also working on her own ad campaign for Heinz ketchup, which means that she’s using information given to her by Stan, as a friend – the last one she had at SCDP. While SCDP are giving their presentation – one which never mentions ketchup – Peggy and company are waiting outside the door, ready to show what they’ve got. Don, Pete and Stan are surprised to see their competition, and, after Peggy and Teddy enter the hotel room – which was paid for by SCDP – Don lingers to listen in from outside the door. 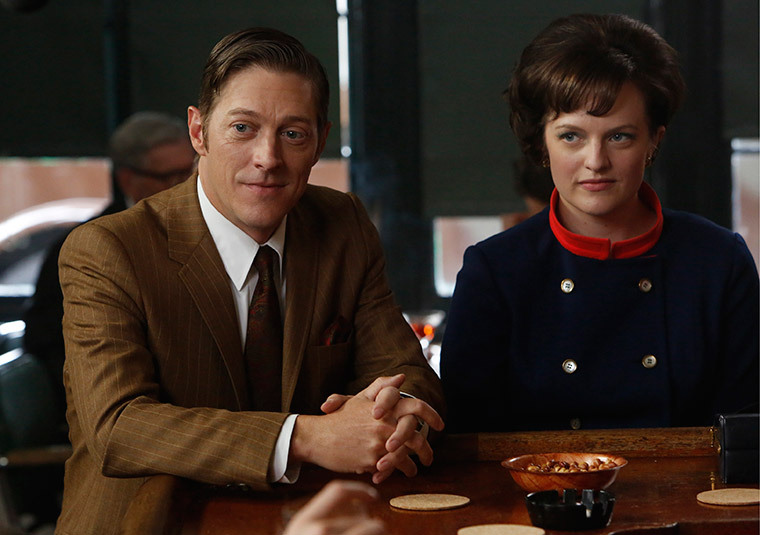 Peggy’s pitch is much better than Don’s and she even finishes her spiel by stating “If you don’t like what they’re saying, change the conversation” – a catch phrase taken right from Don’s mouth. Neither agency gets the account, that’s awarded to J. Walter Thompson, but then Don finds out that he’s also lost Mr. Beans’ account, most likely forever. The opposing teams meet up afterwards in a bar, licking their wounds, and Stan flips off Peggy as he and the others from SCDP leave. 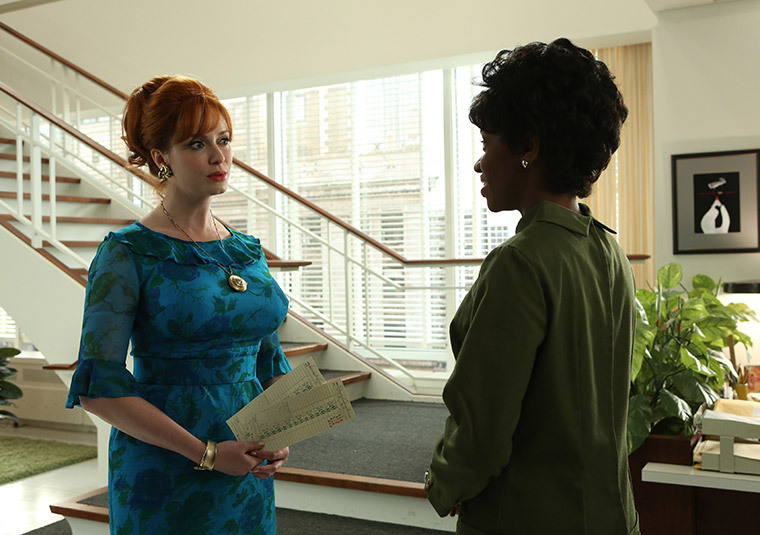 Joan’s having one bad day after another as her authority and right to a partnership is being questioned. We sort of knew that this would happen eventually, after watching her one-night stand with Herb, the Jaguar dealer – part of the agreement for her to make partner. When she finds out that Harry’s secretary, Scarlet, skipped out of work early and had Dawn, Don’s secretary, cover for her by punching out her time card, Joan fires Scarlet. Dawn’s fate is yet to be determined. Harry arrives back at the office, having saved the Dow account, and sees Scarlet leaving with her belongings in a box. 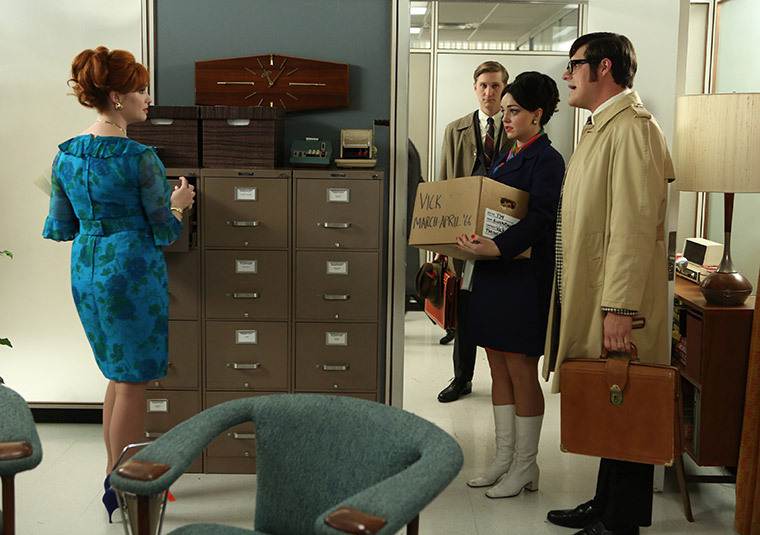 He makes a beeline to Joan’s office and tells her that he’s sick and tired of her “petty dictatorship”. I have a feeling that he wouldn’t have dared to challenge Roger or Don or Bert, but this is Joan and she’s just a woman. Joan tells the bewildered secretary that the choice is hers and Scarlet chooses Harry. Are those two sleeping together? Must be. Joan moves on to a partners’ meeting, but Harry just can’t let it go. He follows her to the boardroom, thinking they’re talking about him and barges in on the group. Harry then does exactly what we all knew he’d do. He throws Joan’s tryst with Mr. Jaguar in her face, ranting about how his “accomplishments happened in broad daylight” and that he deserves to be a partner more than Joan does. I suppose he’s right, in a way, but it was cruel and Harry has no idea what it’s like to be a woman in the workforce in 1968. Roger and Bert don’t find his tirade all that though-provoking or professional, and Roger wonders aloud if they can fire him before he cashes his commission check. Joan’s friend Katie is visiting and, when Joan comes homes from work, she finds her mother and Katie having a little fun with Mary Kay makeup. Katie’s a sales rep for the company but is in the city to see if she can land a job with Avon, instead. Mom’s made dinner for them all, but Joan says she’s got reservations at Le Cirque. Somebody must have realized that she was going to have a long wait for a table – Le Cirque didn’t open its’ doors until 1974 – 6 years after this episode takes place – because they do eat mom’s roast. The two women go out on the town and end up in a club where they hook up with a young man who Katie ends up making out with. The next morning, Joan and Katie wake up in Joan’s bed and Katie tells her friend how she envies her life – a baby, a career, a partnership. Joan explains that her title is just that – a worthless title. She’s worked for SCDP for 15 years and they still treat her like a secretary. When Joan arrives at work, she calls Dawn in to tell her what type of discipline she’s going to face. Dawn can’t be fired, the partners have made it clear that as the only African-American at SCDP, her position with the agency is set in stone. Instead, Joan tells her that she’s putting Dawn in charge of the supply room and the time cards and hands her the keys to both. Dawn sees this as an opportunity, a sign of trust, but Joan assures her that this is how people come to resent you. Dawn says that she doesn’t care who hates her, as long as Joan doesn’t. Joan simply says “We’ll see”. Don isn’t through punishing everyone around him, because he can’t punish himself for his own failures. He shows up on the set of To Have and To Hold, to watch Megan’s love scene. When the director says “cut”, Megan heads to her dressing room and Don is on her heels. He belittles her and her acting by telling her that she gets paid to kiss people. She tells him that she’s tired of him ruining every good thing that happens to her, but he isn’t listening to her anymore. He’s made up his mind that she, like Joan, his step-mother and all other women, are just prostitutes. Don then heads back to his apartment building for his own assignation. He checks under the Rosen’s mat and finds the penny. Sylvia opens the door and the two make their way to the bedroom. Don notices that Sylvia is wearing a cross on a chain and asks her to take it off while their together. She won’t take it off and Don asks her if she prays. She says that she does and he wants to know if her prayers are for him. Sylvia says that she prays that Don will find peace. Those prayers are probably going to go unanswered and now we know that Don Draper can be had for a penny. 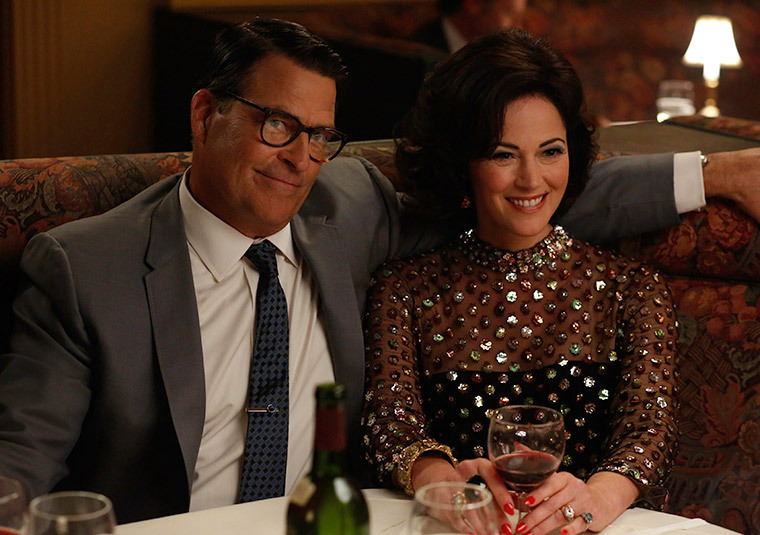 This entry was posted in Mad Men and tagged Bert Cooper, Don Draper, Joan Harris, Mad Men, Peggy Olsen, Roger Sterling. Bookmark the permalink. Thanks Empress, did you enjoy this episode or find it interesting? I sort of thought I’ve seen this episode already. Maybe that is the point. The SDCP crowd is stuck in repeating their same patterns. Harry still makes wild claims to saving the agency all by himself. Joan still doesn’t get any respect even from herself. Don is still throwing himself in front of trains hoping one will run him over. Ken Cosgrove is a nice man no matter what the circumstances. Hey K, I liked this episode and did find it interesting. I never thought of Joan as a victim until the past couple of seasons and I’m not entirely sure that that’s going to define her. She always seemed like the voice of reason at SCDP and the smartest one of the whole bunch. Her relationship with Dawn may be one of the best storylines, or the worst, depending on how the writers treat it. Joan really doesn’t have anyone she can exercise any authority over except Dawn, so she can either mentor her or torment her. I like some of the changes in Peggy and hate some of them as well. Using some of the same tricks as Don isn’t a very good look for her but she’s really talented in her own right – hopefully she realizes that.